HOMEGeneral NewsWill New Army Tattoo Policy Affect Tattoo Removal Pricing? 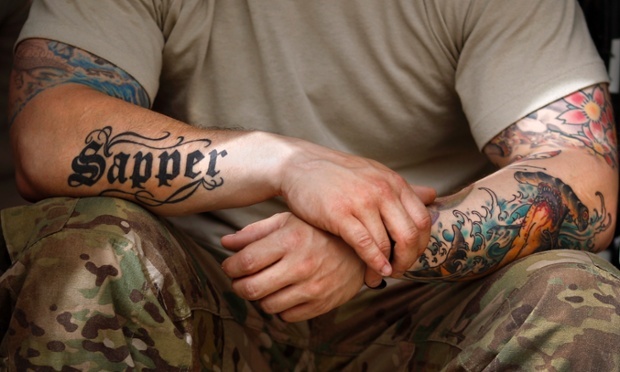 Will New Army Tattoo Policy Affect Tattoo Removal Pricing? This may sound curious to some, but even though we are in the business of tattoo removal, we actually like tattoos. Well, we like quality tattoos. But there is something we like even more than tattoos… Our soldiers. It’s always such a bummer to have to remove good artwork from a soldier that serves our country with their life, particularly when it was at one point accepted. We heard first hand how this policy affected our soldiers and the overall moral of the companies. The bull horn enforcement that took place on March 31st, 2014 brought us more business, but not the kind of business we felt good about. We did what we could to help lessen the blow to these people we are so grateful for, and started a program specifically designed to assist enlisted and aspiring soldiers by offering discounted pricing and payment plans due to the situation. We have frequently been asked if the Reg. changes have affected our business. Truth is, we have seen an increase of 28% compared to when the initial policy change took effect in March 2014, and an increase of 31% since the most recent policy change took effect on April 1st, 2015. Whether the increase is in direct correlation to the recent policy change is still in review. However, we can say with certainty that our Military discount program will continue to be offered to those who have served, those who are currently serving, and those aspiring to serve. Whether getting a tattoo removed, or having it lightened to make way for more modern artwork now that you can, we’ve still got your back! One Comment to "Will New Army Tattoo Policy Affect Tattoo Removal Pricing?" Proud to serve those that SERVE! Blessings to all our Armed Services, blessings on the New Canvas. God bless America!